Separate the boot from the joint sub-assembly. 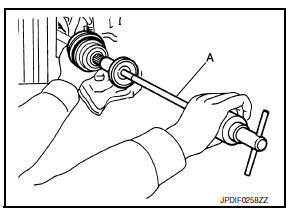 If the joint sub-assembly cannot be pulled out, try after removing the drive shaft from the vehicle. Refer to FAX- 30, "6M/T : Disassembly and Assembly (LH)". Remove the circular clip (1) from the shaft. Wrap the serration on the shaft with tape to protect the boot from damage. Align with the shaft and the joint sub-assembly. 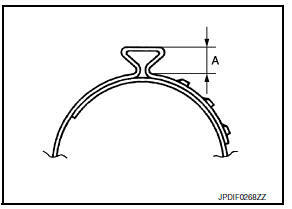 Assemble the shaft with the joint sub-assembly while holding the circular clip. 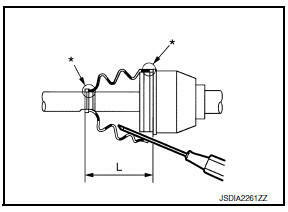 Install the joint sub-assembly (1) to the shaft using a suitable tool. Clean the mating surfaces of the wheel hub lock nut and the wheel hub assembly. Install the drive shaft to the wheel hub and bearing. 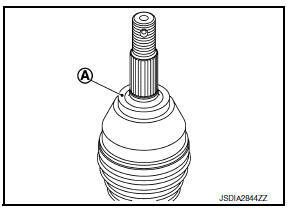 Temporarily install, but do not tighten, the wheel hub lock nut. Install the transverse link to the steering knuckle with the nut and bolt. Refer to FAX-8, "Exploded View". 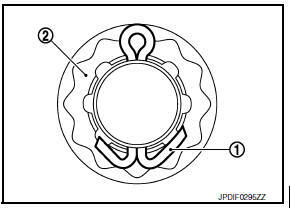 Install the nut retainer (2). Install the cotter pin (1). Securely bend the cotter pin to prevent rattles. Install the wheel sensor, the wheel sensor bolt, and the wheel sensor harness. 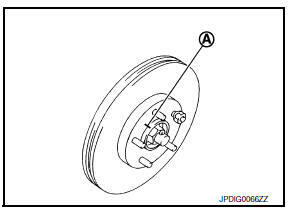 Refer to BRC-106, "FRONT WHEEL SENSOR : Removal and Installation". 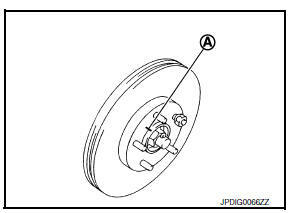 Align the matching marks (A) on the disc brake rotor and on the wheel hub and bearing. Install the disc brake rotor. Remove the wire from the brake caliper. Install the brake caliper and the brake caliper torque member bolts. 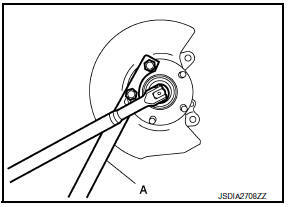 Refer to BR-41, "BRAKE CALIPER ASSEMBLY : Removal and Installation". Do not twist the brake hose. Install the wheel and tire. Refer to WT-47, "Adjustment".